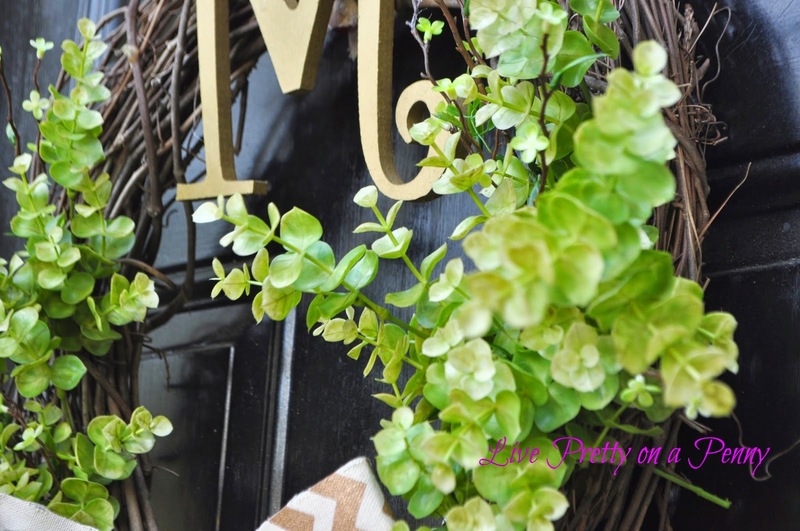 Continuing my spring refresh updates, my front door was on the short list to receive a new welcome wreath. Lucky for me, I was contacted by One Kings Lane and asked to share ways that I am personally incorporating spring into my home! Well… this worked for me because I am totally motivated by seasonal changes, especially warm ones to make changes around my house. 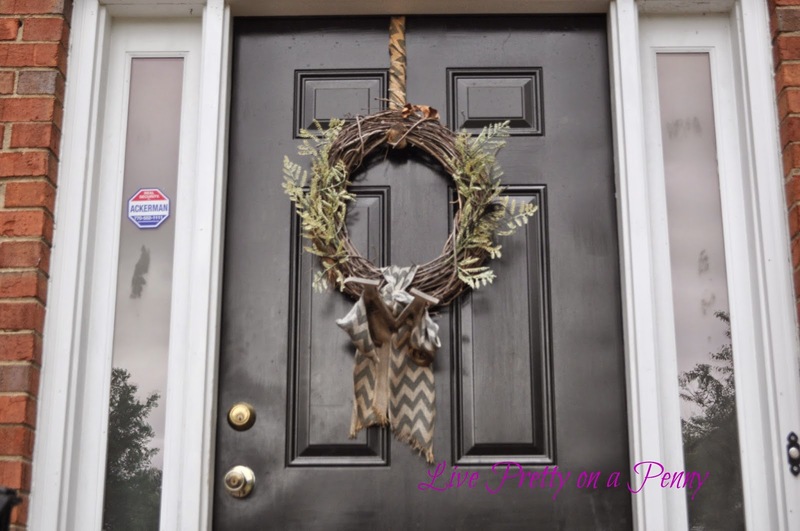 Since my front door is an extension of my yard and the inside of my home, I knew that my entry wreath needed a complete makeover. I know…it looks rough. It’s been up since last spring and let’s face it, winter was harsh. So anywho, I headed to Hobby Lobby to purchase some supplies and got to upgrading! 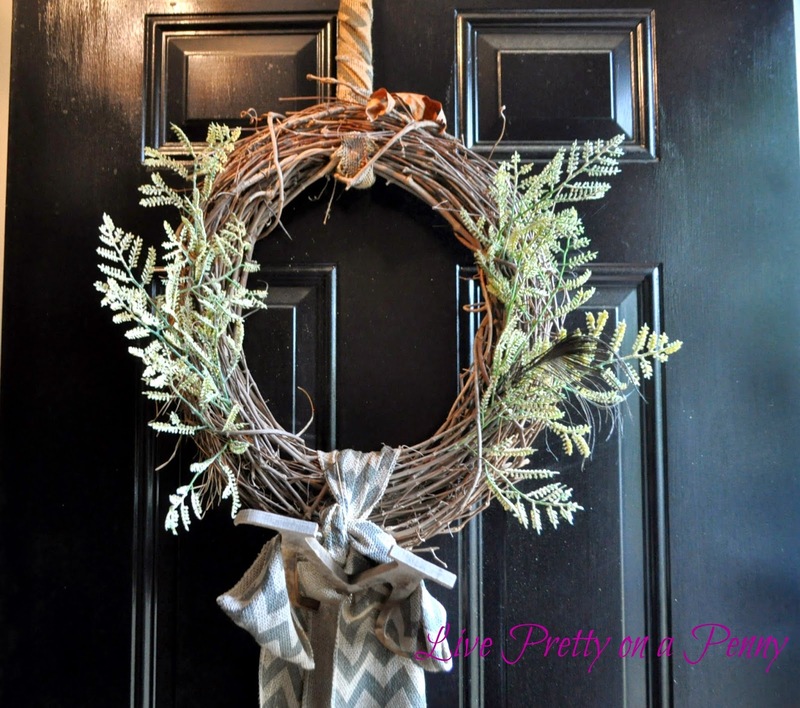 To save money, I decided to reuse the old wreath, but strip off all of the worn materials that were on it. 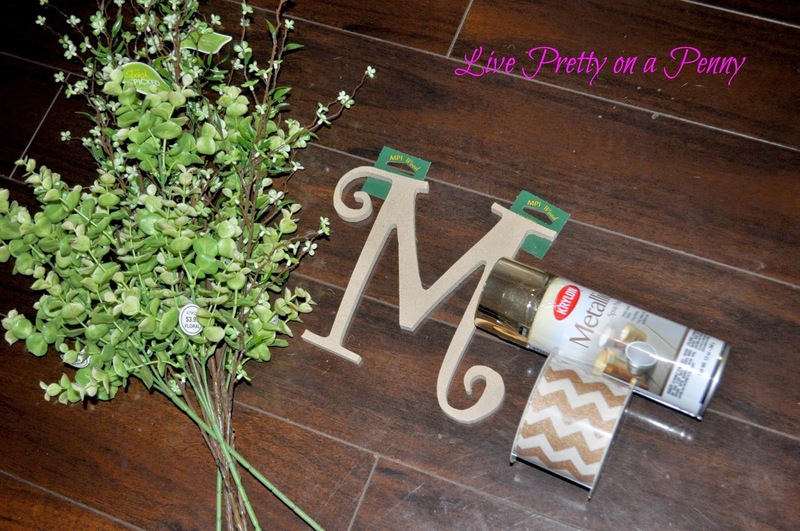 I purchased several lime green faux filler stems for 50% off of $5.00, a new monogram M, chevron gold ribbon, and metallic gold spray paint. All in all, I spent $20.00. Using a wire cutter, I cut the stem off of each plant, placed hot glue on the tips of the stem, and placed them randomly by eyeballing where i wanted it placed. 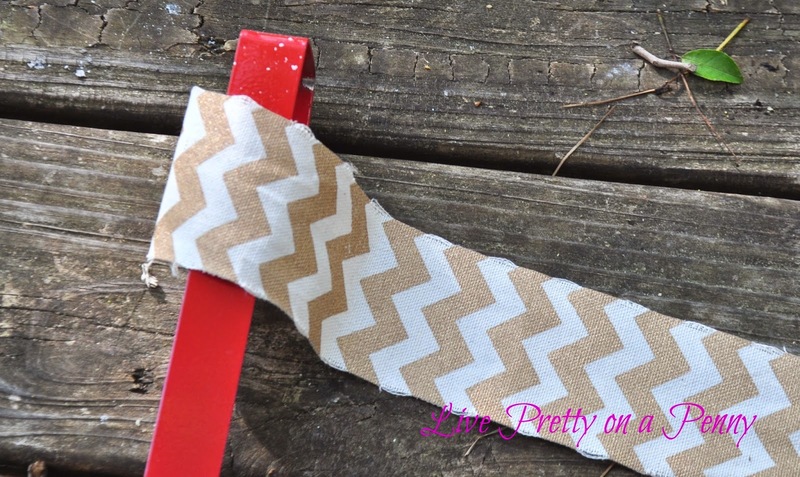 If you think eyeballing won’t work, then I suggest placing first then hot gluing once you decide placement. Also, instead of buying a new hook, I just reuse the same hook each time, including for Christmas. I just take a dab of hot glue, and wrap coordinating fabric around the hook to match the wreath. 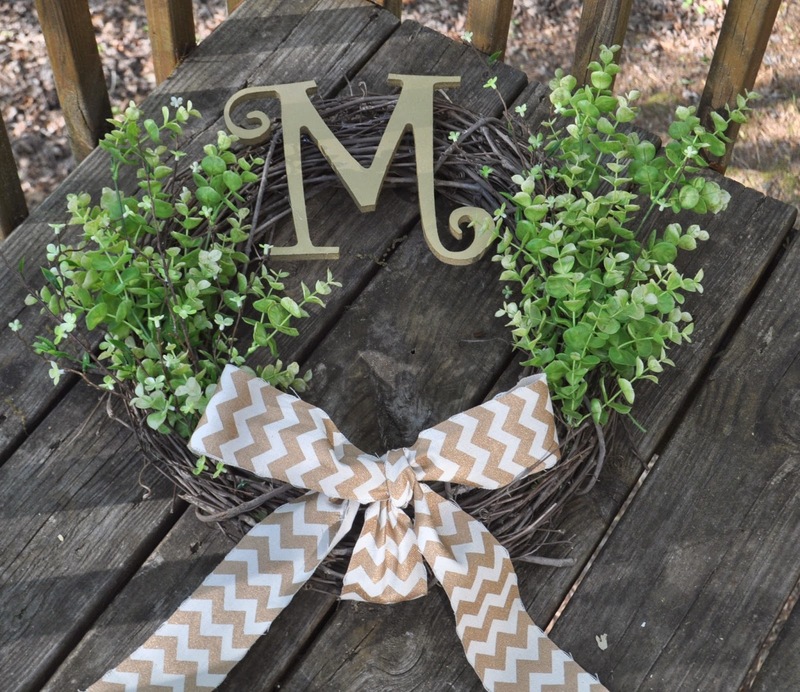 Here is my finished wreath…. I am a firm believer that the entryway should be shown just as much love as any other room in your home. The One Kings Lane Home Decor Resource Guide offers many ways that DIY enthusiasts can spruce up their entryways through fab makeovers! Though you may already be thinking it, this is not a sponsored post. I just felt that the Resource Guide serves a valuable tool for those looking for various ideas and inspiration in home decor. 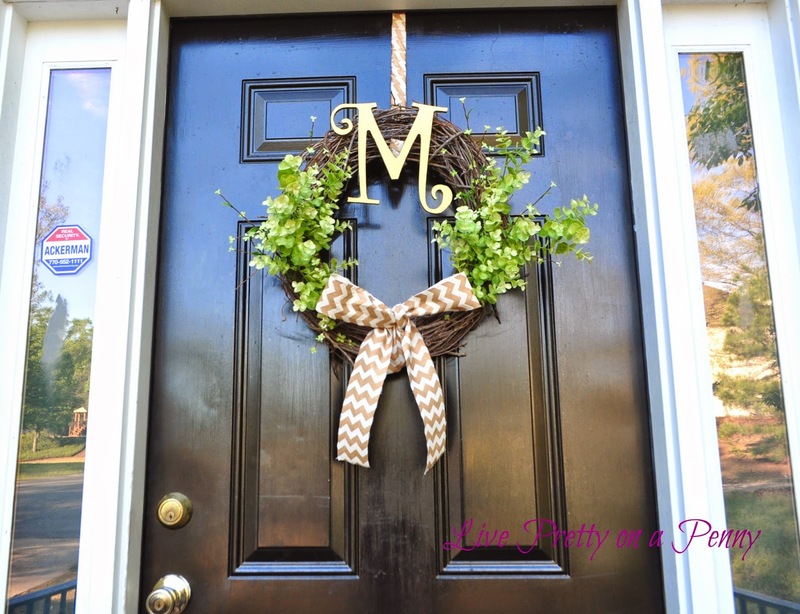 Thanks so much for checking out my wreath! Are you working on any fun spring updates or doing a little sprucing? Let me know in the comments below! I think that does it for me and my outdoor projects for this year. I have a list of things that I want to tackle inside, so its time to move along! Hey Erin this wreath is great. I love the updates you did, I must go buy a wreath now, lol! Im forreal tho! Look for a inspiration post soon. 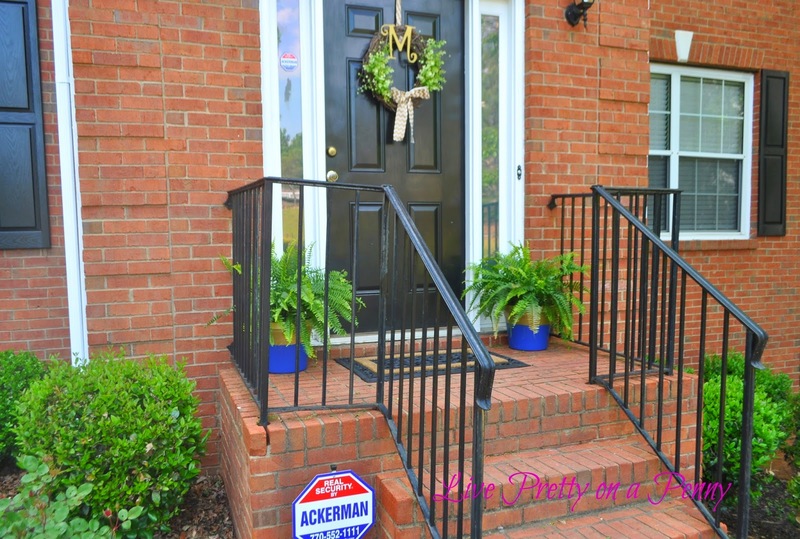 My front door has been wreathless since Christmas but I'm inspired to get on it this weekend! Thanks for the inspiration! You did a great job with your wreath. It's sooo pretty and perfect for Spring. It looks really pretty! Love the way it looks against your door too.